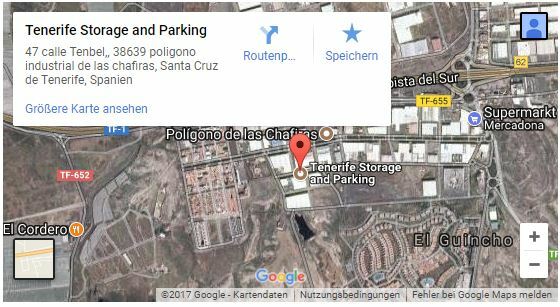 STORAGE & AIRPORT PARKING in SOUTH Tenerife from just 1 Euro a Day! Our unbelievable prices start from €0.35 cents a day, Cars stored From ONLY €1 a Day! No other storage in Tenerife offers our level of security and peace of mind, rest assured your belongings are secure and protected with 24Hr monitored security and round the clock CCTV. Our helpful and friendly staff are here to help, call us on 693789670 or email us: info@tenerifestorage.com for more information so we can help you to find the perfect storage solution for you! - 24hr security connected to monitoring station & policia. - Round the clock CCTV MONITORING. - Short & Long term storage. - Clean and dry environment. - Man with Van service for removals. - All of Tenerife covered. Message us on Facebook, whatsapp, call or text us 7 days a week! With over 100 satisfied returning customers, TENERIFE STORAGE has been storing customers goods for over 4 years and are growing year on year! What are you waiting for, contact us for a free quote today! Das ist aber nicht der in der Nähe vom Markt, oder? Der ist nämlich seit Ewigkeiten geschlossen. Die hatten zwei Lager. Eins im Norden und eins in Las Chafiras. Ob das im Norden noch offen hat? Würde ja keinen Sinn machen, die Werbung war neu. Wenn ich die. Tage in Chafiras bin, schau ich mal und berichte. Befindet sich hinter Coca Cola auf der Avenida TenBel. Zuletzt geändert von Achined; 22.07.2017, 17:40.